Diary of a Mall Girl is published in paperback and e-book format in March 2013 by Curious Fox. 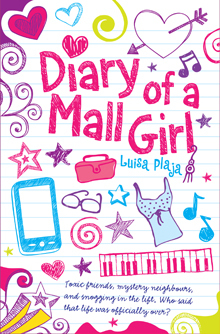 Molly Hart lives in a massive shopping mall and has access to all the best shops, entertainment – and more gossip than she’d sometimes like about her classmates and their crushes…. The mall is the heart of the fifteen-year-old Molly’s suburban town. Most teens hang around with friends there, get their first job there, and experience their first kiss there. And Molly? She actually lives there, in the complex’s residential wing, where she navigates the dramas of teenage life. But is living in a massive shopping centre as much fun as it sounds? Well, yes… and no. Find out the whole truth in Molly’s private diary! 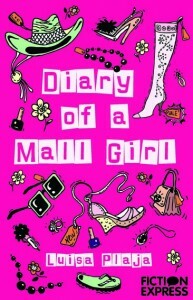 Read more about Diary of a Mall Girl at Curious Fox. Diary of a Mall Girl started as an interactive e-book written by me and published in weekly instalments by Fiction Express, with readers voting on what happened next after each chapter. Thank you to all the readers who helped shape Molly’s life and loves! Diary of a Mall Girl has been translated into Finnish by Eeva Mäkelä, titled Ostaritytön päiväkirja and published by Stabenfeldt AB.